I’m going to be completely honest with y’all… I have strayed from my usual workout regime since our move to Chicago. With a 50 hour work week, lovely family at home and blogging obligations (I’m very thankful for each of these) I’ve been a little short on time. Which is why I love this ab routine! Life gets in the way, and since I haven’t established a workout routine, yet, having something effective that I can do at home is essential right now! I’ve found that going to the gym for an hour… especially as a girl; all the changing, commuting, and showering afterwards, always adds upto much more than an hour. Making it too easy to use the excuse of no time. However, I do fully plan on getting a membership for these friged winter months, I still need my cardio! Anyways, spend 10-20 minutes going through this routine a few days a week and your abs will be back in no time! I like to wake up a few minutes early and do it right when I get out of bed, before I shower and get ready for work! It’s a sequence of my favorite ab exercises that work the upper and lower abs as well as the obliques. Full package all in one session! The more you implement exercising into your everyday, the more you will want to do it. Naturally becoming more routine week after week until you’ve created a wonderful healthy habit! Warm up your abs with a nice plank, not everyones favorite… but a wonderful static workout for toning and engaging your core from top to bottom. Start your side plank with your bottom foot in front of your top, hip should be raised, shoulders away from your ears. If you feel the burn… hold it here! Kick it up a notch by lifting your bottom leg and holding it parallel to the ground. This is my favorite oblique exercise! Bring that knee in to a crunch meeting your raised elbow. This is the ultimate side crunch. Working the lower abs, with your shoulders raised off the mat (this helps keep your upper abs engaged) bring your knees together and pull them in toward your chin. To do this, rotate your hips, curling them upward and off the mat. Slowly unfold, pushing your legs straight out in front of you. If you need a modification, let your feet touch the floor between each one, but just for a second! Leroy is my mid-workout distraction, I try to avoid taking any breaks to get the best out of the workout. But, he’s just too cute! And loves to stand right over me when I’m on the mat, so very hard to ignore haha. Tying the obliques back in, a steady bicycle. Touching your elbow to the opposite knee and rotating from one to the other. Raise those hips! This is a great lower ab workout. The goal is to go straight up, I always end up falling back a little, theres always something to work on. Use your lower abs to pull your hips off the ground, pushing your feet straight up toward the ceiling. Keeping your legs together and straight, lower them to 6 inches above the ground then go right back up! A good modification here if you find your lower back coming off the ground is to put your hands under your tailbone. Ta Da! There you have it, a few of my favorites for a solid core! (1 minute hold) first hold a 30 second plank then do 12 oblique crunches and finish holding static plank through 1 minutes for advanced. hold a 1 minute static side plank with lower leg lifted for intermediate. hold static side plank for 1 minute both feet on the ground for beginner. 1 rep = curling knees in to chest and extending back out. 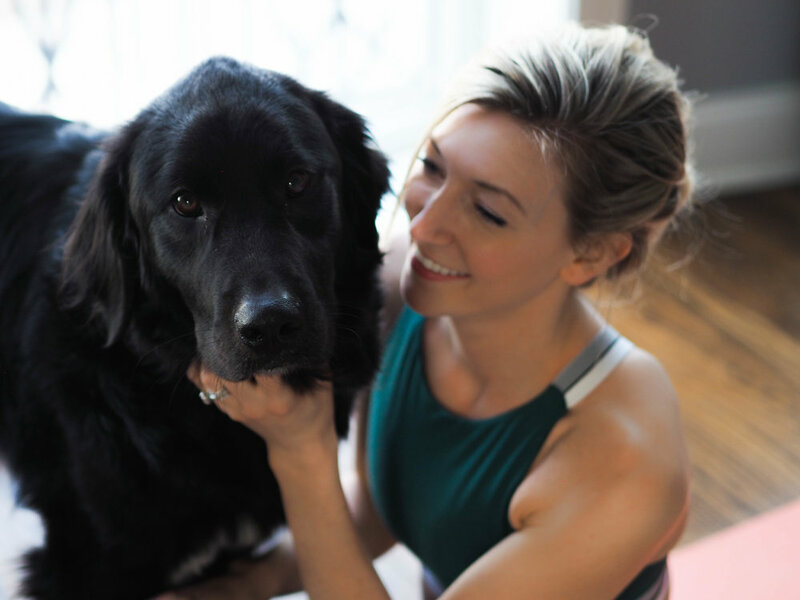 TRY NOT TO TAKE A BREAK– UNLESS YOUR PUP MAKES YOU! if you’re feeling up to it… top it off with one more plank! Hold a 1 minute plank to engage your entire core one last time.